Today we are happy to have LeAnn of Living Waters as our 'Guest Poster' today. She's one of our favorite bloggers of all time and is going about doing much good online. She often leaves comments for many bloggers (including on here) and...is always very kind, thoughtful and uplifting. We invite you all to read about some of her Christmas memories and traditions and then, read her blog. She's a great example to the rest of us - about living what you share. We thank her for taking the time to write! Enjoy! "For Unto Us a Child is Born...."
Christmas memories continue to reinforce the overall magic and the wonder of this season. My husband and I began dating 52 years ago in November. As we moved through the month of December the fun of being together and bonds of friendship strengthened. 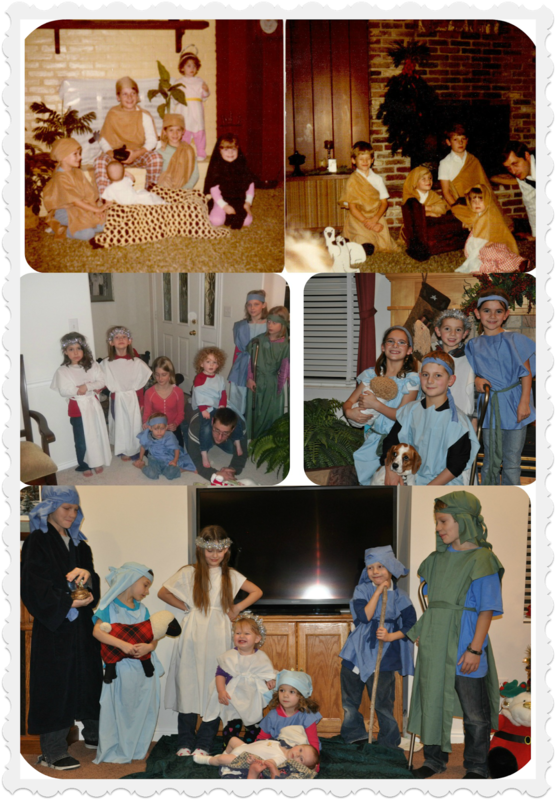 Christmas seasons through the years represent some of the best days of my life. For the two of us in the beginning, and then with our family, Christmas's have always been treasured moments. Having the Savior at the center of our Holiday Celebration has always been the priority. We enjoy this season of loving, giving and receiving. We love the real meaning of Christmas. We enjoy the symbolism of Christmas found in the Nativity, Santa, decorations, magical music and heart warming stories. Let me share three favorite Christmas traditions we have maintained throughout our years together. Our first tradition is a family Nativity program to celebrate the birth of our Savior, Jesus Christ. I've always felt strongly about the true story of the Birth of Christ as recorded in Luke 2. My love for the first Christmas story began when I was in eighth grade. I was asked to be the narrator for the school program. I memorized Luke 2. This favored experience influenced my desire for my children to grow up knowing this rendition of the birth of Christ. Everything about our simple program, from the carols we sing to the spontaneous acting by our children, grandchildren and now our great grandchildren contributes to the spirit of this miraculous event. 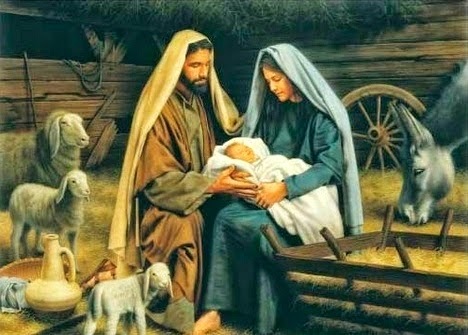 There is never a dry eye for me when I am watching the Nativity unfold as it is retold. The second tradition began early in our marriage when my husband and I decided we should try to come up with something really fun and unusual as a Santa gift to each other. It does take a little creativity to come up with something unique each year. It requires listening for little hints through the year. Once he told me that as a child he never had a teddy bear. I couldn't imagine that so I gave him a really adorable teddy bear that year and he became emotional when he unwrapped it. Then there was the year that Cabbage Patch Dolls were the rage. They were very difficult to find at the time and you had to wait in long lines just to get a single doll. Unbeknownst to either of us we got each other a Cabbage Patch Doll. Here is a picture of our Cabbage Patch Dolls~. Our three daughters each got one too. We had such a good time with all our dolls that day. I love dolls and he loves airplanes; so we have given each other these as gifts through the years. Once I told him that I had had always wanted a Annie Oakley Pop Gun. Santa didn't bring this particular gift to me as a child but my husband found an antique on e-bay. This is a treasured gift. Our third tradition is also a favorite Christmas activity. After my husband graduated from Pharmacy school we moved to San Jose, California. The ward we were in had a Christmas tradition entitled; 'Christmas Heart Family'. Everyone that wanted to participate put their family name in a jar and then each of us drew out a Heart Family name. The idea was to deliver gifts to your Heart family at least one time during the Christmas season. These gifts were to be inexpensive, creative, homemade, or purchased if you preferred. It was truly a fun activity. One year, our two older boys crept stealthily towards the Stake President's front porch to place a gift. As they were sneaking away, one of the boys in the family came around the corner of the house, spotted them and tackled one of our sons. No surprise left with that gift. Another time we gave a really cute Christmas Carousel to our chosen family. The very next year they gave it back to us anonymously. We laughed about that one. We have introduced this activity to other wards we have lived in. Our children through the years really enjoyed this activity and had fun deciding on just the right gifts to give and a delivery strategy to avoid being caught when delivering the packages. The tradition spread and members that participated had many heart-warming experiences to share over the weeks that followed. We have loved doing this through they years. During years when our Ward does not participate we enjoy finding a family that could benefit from some extra attention and so the tradition goes on. Now we have our Grandchildren to help us serve our Christmas Heart Family. I love blogging and reading good uplifting blogs. My blog is entitled: "Living Water's by LeAnn." I love to blog about my faith, my family and my own musing. I have loved following "Mormon Moms". The posts are always uplifting, inspiring and fun. I am happy to have the opportunity to do a guest blog on this site. I am have been married to the most marvelous man for 47 years. We have three sons and three daughters in that order, 32 Grandchildren and 4 great Grandchildren. I enjoy every moment I can have with my family. I am blessed to work in the Jordan River Temple as an ordinance worker. I teach three precious little 4 year old boys in the Sunbeam class in Primary. I enjoy writing, playing the piano, reading, crocheting and Family History. Life is good and I love that I have the privilege of living in this era of time.